In 2007, I started on my first independent position in the School of Biological and Chemical Sciences at Queen Mary University of London. Two years later Sir Nicholas Montagu was appointed Chairman of Council and Simon Gaskell was appointed Principal of the University. 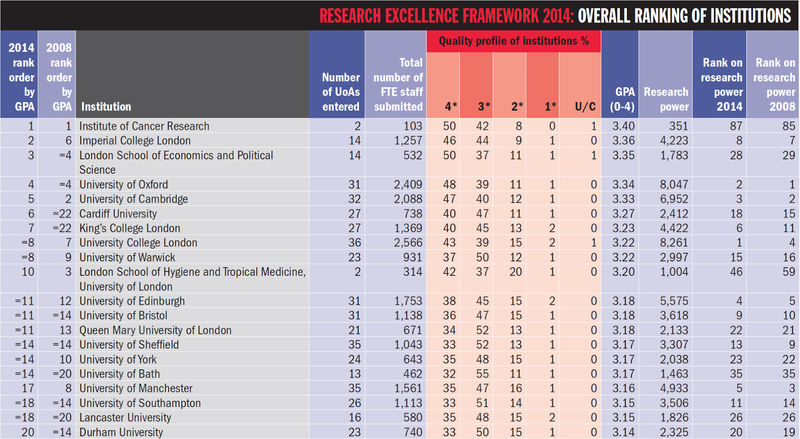 They formulated a strategic plan with the explicit aim to rank QMUL in the UK’s top-ten list according to the Government’s Research Excellence Framework assessment. Simon Gaskell appointed Jeremy Kilburn to head the Faculty of Science and Engineering. Jeremy Kilburn took controversial decisions leading to a sharp change of culture in the Faculty and using invariably as a singular justification the ranking ambition of the University. 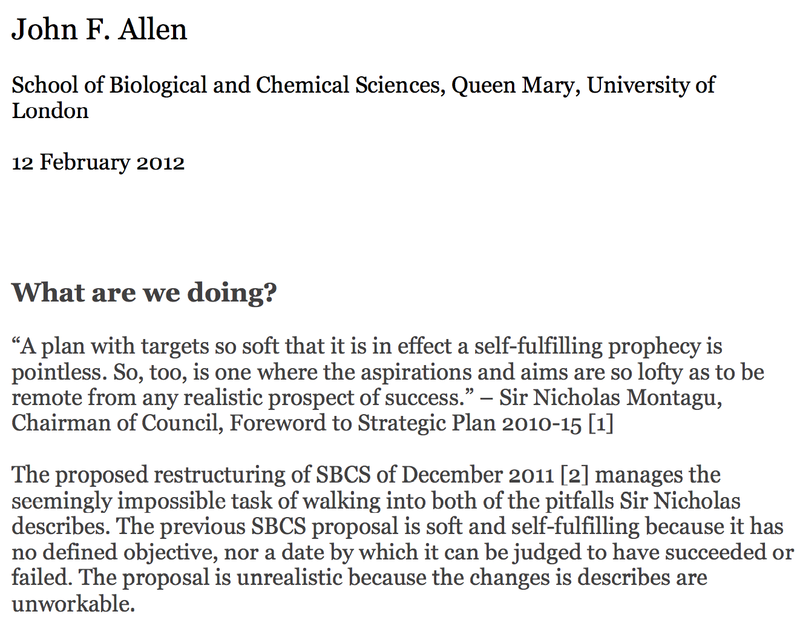 In response to the proposals to “refocus” (sic) our School of Biological and Chemical Sciences John Allen commented: In a few days we will know the broad outcomes of the REF exercise (the detailed outcomes, more meaningful for how departments fared, will be released in the Spring). That Jeremy Kilburn has chosen this week to announce his departure from the institution raised eyebrows. Jeremy Kilburn may or may not be missed at Queen Mary, but his departure demonstrates a blatant unaccountability, especially given how many scientists saw their careers derailed or destroyed because of his decisions. Before receiving news of how the faculty he led was assessed, Jeremy departs. 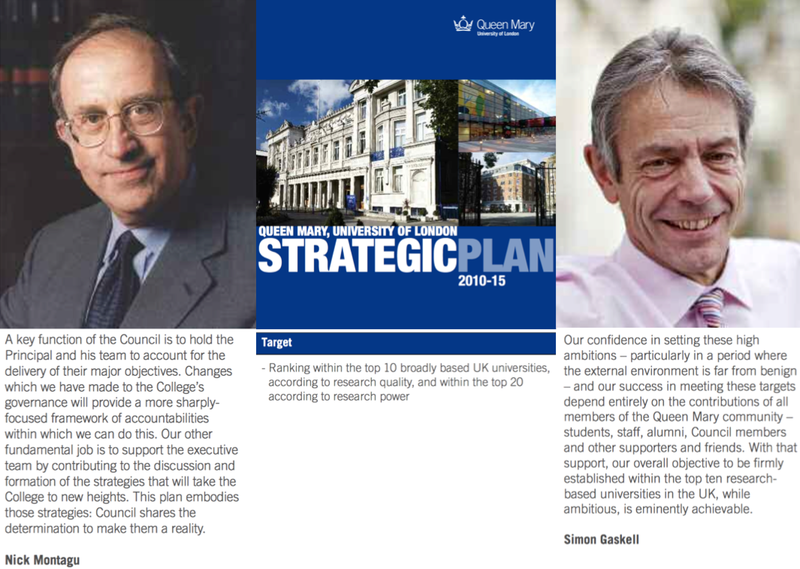 This is a problem of University Governance and Sir Nicholas Montagu’s words “A key function of the Council is to hold the Principal and his team to account for the delivery of their major objectives” sound very hollow. At least Gaskell’s major objective has been a simple one (“rank quality”) and come Thursday we will know if he delivered the reputational yardstick. Κυριακή κοντή γιορτή. On 16 November 2011, I was received by Simon Gaskell to discuss the situation in my School. Here is a relevant note I kept from that meeting. Head of @QM_SBCS, whose decisions were determined as a breach of contract between @QMUL & @ProfJohnAllen, to stand down from July 1st, 2016. The REF results are out. The declared targets were not met. Queen Mary is positioned where it was in 2008. All the restructuring, all the mess and for what purpose? If Simon Gaskell was a scientist at Queen Mary who hadn’t met “objective” targets he would be sacked on the spot. This is a test of whether accountability is understood differently when the person not meeting the targets is an academic or the Principal. After all in his article “From here to prosperity” Simon Gaskell argued that applying “objective” criteria was the only operational way acceptable to him. I hope he shows by example that these “objective” measures apply to him and resigns. Short of that, I hope Sir Nicholas Montagu asks him to do so, following his statement about holding the Prinipal to account for the delivery of his major objectives. Have Gaskell & Evans resigned? Why does Exeter College endorse the arbitrary sacking of University staff? By electing Sir Richard Trainor as Rector, the Fellows of Exeter College have changed the values which were the hallmark of the University of Oxford. Changed for the worse, by welcoming as their Rector a man who has shown no concern for the defense of academic disciplines or academic values. The new brutalism has entered Oxford through the portals of Exeter. As Principal of King’s College London Trainor attempted to ‘disinvest’ in American Studies, Byzantine and Modern Greek, Philosophical Linguistics, Palaeography, Engineering and Psychology. He proposed cutting 205 jobs. In 2014 King’s announced that 120 scientists would loose their jobs. Do the Fellows of Exeter believe that these disciplines should be cut at the whim of an administrator? The actions of Sir Richard Trainor rightly aroused international protest, almost every university philosopher signed a petition protesting at the proposed sacking of Prfofessor Shalom Lappin FBA and medievalists, Directors of libraries and archivists signed a petition protesting at the closure of the unique Chair of Palaeography. 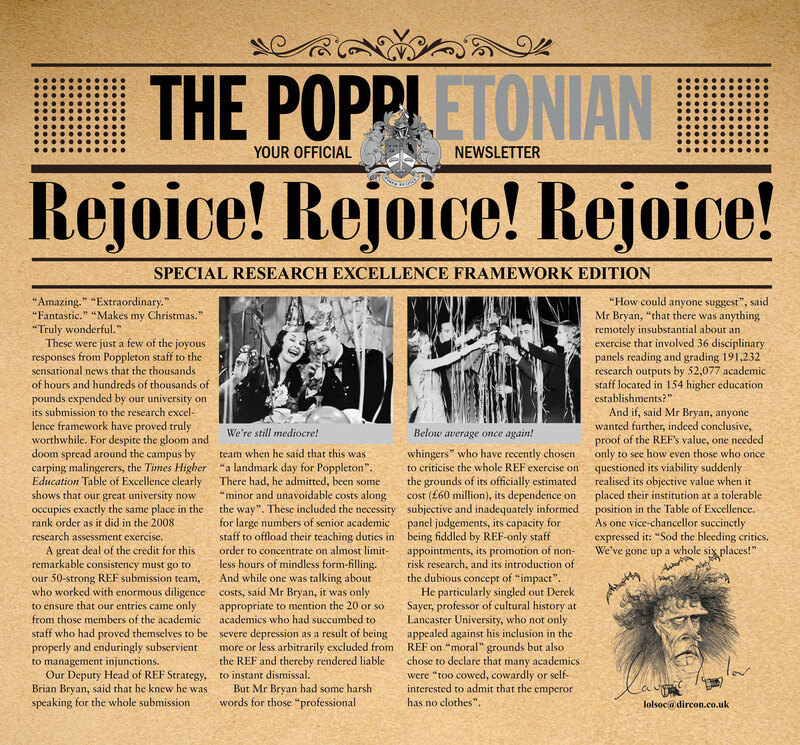 Why do the Fellows of Exeter believe that this proven ability to ruin a reputation is irrelevant to their choice of Rector? Sir Richard Trainor refused to answer the letters he received about his policy decisions. Do the Fellows of Exeter believe that that sort of engagement with fellow academics should be the public face of the College? Do the Fellows of Exeter believe that Sir Richard Trainor brings managerial skills to his new post? Do the Fellows of Exeter assert that Sir Riichard Trainor’s ethical standards are now those of the College? When Sir Richard Trainor told staff at King’s College that cuts were necessary he was invited to donate some of his salary to the College as a gesture of solidarity. The previous Principal of King’s College earned £186.000 in 2002, Trainor’s salary rose steadily to over £312,000. Do the Fellows of Exeter value this level of greed? I am reminded that when I came to realise how decisions were being made in management circles at Queen Mary, I had never imagined that there would be other examples in the country of such disregard to social and academic values not to mention consultation. Unfortunately, I am presently in a position where with any indication that some “higher education” institutions still run on the opinion of their academic bodies, I rejoice. I also keep asking what should be done to bring about positive change and keep academics engaged in the running of their institutions. The search for the replacement has started via a private recruiter. Jeremy is on a quick start on the restruction of the University of Aberdeen. Now Jeremy Kilburn is ready to do the same in Aberdeen University. and staff is taking action! I am delighted to announce the appointment of Professor Edmund Burke as the next Vice Principal and Executive Dean, Faculty of Science and Engineering. Professor Burke is a distinguished computer scientist and is currently Senior Deputy Principal and Deputy Vice Chancellor at the University of Stirling. Edmund holds degrees in mathematics, at bachelors and masters levels, from the University of Leeds, and a Ph.D. in Computer Science and Mathematics, also from Leeds. He held several academic positions at the University of Nottingham, where he served ultimately as Dean of the Faculty of Science, before his move to Stirling. He has maintained an active research programme which will continue at QMUL within the School of Electronic Engineering and Computer Science, where he will hold the title of Professor of Computer Science and Operational Research. Professor Burke will join QMUL for the start of the next academic year but hopes to make several visits before that time. I am sure you will join me in welcoming him to QMUL. for the story, the Life Sciences Initiative was conceived to compete with the Francis Crick Institute. I am not joking.